My mother told me that Japanese Canadians didn’t always have the right to vote, so I should never take that for granted. This year, the Vancouver Election seemed especially complicated with so many independents and new parties. So I actually read through the blurbs of each candidate. Now I wasn’t that meticulous or thorough but I was looking for impressions. On my first pass, I eliminated people who supported things I was not so keen on. Then of those, I jotted down points they made that I agreed with and I sorted them by the number of points I agreed with. If they were tied, I would review the points and decide which ones I preferred. So I had a list of people I was at comfortable voting for. It turned out they were from a variety of parties. I thank all the candidates for participating. Congratulations to whomever gets in. I don’t know what they should do, so I hope they can figure that out. I went to hear Michio Kaku speak at the Chan Centre at UBC. I was delighted to see that the place was sold out for a talk on science, which UBC President and scientist Santa Ono also commented on. Kaku indicated that the growth of wealth in the world is the result of successive waves of innovation related to physics. Steam, electricity, internet. 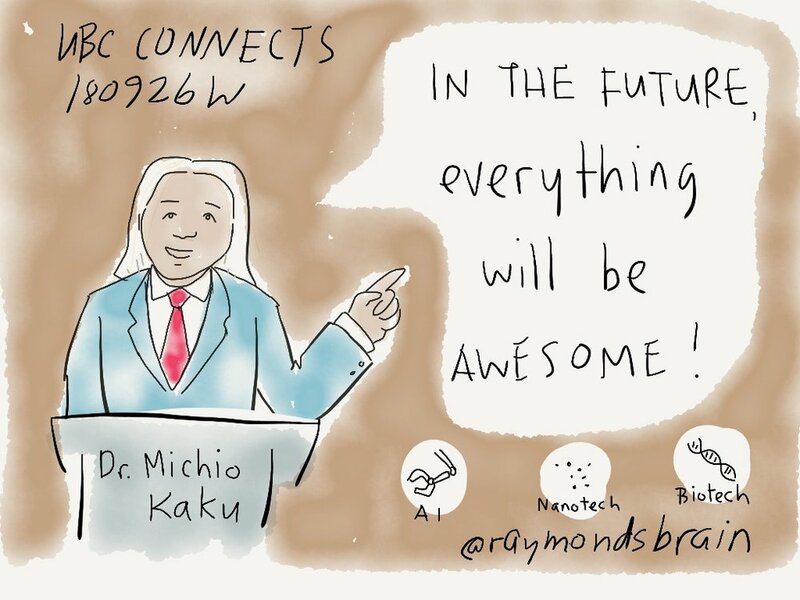 The next big things are artificial intelligence, biotech, and nanotech. He was quite entertaining and was unashamedly optimistic about the future, and maybe that encourages people to make things happen, as opposed to focussing on the problems. For my birthday, we went to a fancy restaurant downtown. We did the 7 course tasting menu. Each was such a delight in its own way, featuring ingredients from BC. Goat cheese like a fine powder. Melt in your mouth pork jowl. Sturgeon in a creamy cauliflower emulsion. Even a pre-dessert of cherries and ice cream. Naming the ingredients insufficiently describes the experience. We did tell them of my sesame seed intolerance, but they were included and I ate them. Fortunately, I felt no ill effect, but they were quite concerned and took my whole meal off the bill. I took transit to the Nikkei Centre in Burnaby for some stimulation. The normally quiet garden where seniors play gateball was jam packed with people lining up for Japanese street food, as kids hoisted the portable shrine and marched around to the beat of a drum. Inside, with admission, more games and food and gifts for sale, as dancers danced on stage. And the museum featured Kayla Isomura's sobering exhibit featuring photographs of what Nikkei descendants would take with them if they were to be suddenly uprooted today, providing an intriguing perspective on the role of historical consciousness. I always enjoy going to the Powell Street Festival and the weather was perfect this year. Terry Watada read from his book Three Pleasures on the riot by Japanese Nationals at the Immigration Building. He described it as a resistance movement, which gives it a more romantic tone. John Endo Greenaway provided rhythmic accompaniment and I think it really added to the dramatic feel and sense of violence. I had beef curry with rice nad corn on the cob with mugi cha. I had imagawayaki, the red bean pastry. I dropped in on some familiar faces. THey so many dedicated volunteers. I heard Zack Davisson talk about Japanese Yokai, mysterious things. He has actually been a translator for Shigeru Mizuki who is best known for his stories of the supernatural, which reintroduced Japanese to these stories and also invented his own. At another talk he spoke about a weird thing of Tsukumogami, enchanted objects, which I'd never heard about before. Things becoming animated after being used for a hundred years. I have been working on a long story incorporating Japanese folk tales into the context of the Japanese Canadian internment, so it was interesting to hear aobut it evolved within Japanese culture as well. I chatted with the artist Nao Uda who grew up in Japan but she had an ancestor who had lived in Canada and she has been exploring that aspect of him. It was an interesting parallel to the work I have been doing about my Baachan. Such an wonderful day. I enjoyed every moment of the second annual Lower Mainland Museum Educators Conference hosted at the Space Centre, the Vancouver Museum and the Maritime Museum. I led a session on designing a photo op. I learned things from every session, including my own — models for science communication, developing educational history kits, building relationships with communities. I felt better for meeting every person I met. Museum educators are the best, probably because they are “not in it for the money.” Sadly, as much as I savour nonmaterialism, this no doubt narrows the field of who can afford to participate. What do they do with all the leftover jam? I volunteered to have my hair cut by Japanese performance artist Yoriko Gillard at the Nikkei Centre. She explores the idea of kizuna, one's connections to others and in this case, issues related to trust. The barber I had in Japan always did an amazing job, and I transferred that trust to her. She was skilled as a stylist, respectful as an artist, and thoughtful as a speaker. I didn't really know what I was getting myself into, but it was an unexpectedly moving, thought-provoking experience. Later, however, my daughter said I looked like the leader of North Korea. I enjoyed Ashley Spires talk about her work at the Vancouver Children’s Literature Round Table Illustrator Breakfast. Her passion for creating books was inspiring. She admitted to emotional ups and downs depending on how well her work goes. Her experiences finding and sharing her personal truth and working with artistic integrity. She seems to be a driven sort of person. She pushed herself to get the training she needed to be a book illustrator, put in a lot of work to strengthen her chops. Maybe this is the kick in the pants I need to up my game. Dog doesn't know she's not going. Enjoyed panel at VPL with writer-in-residence Miriam Libicki, comics journalist Sarah Glidden moderated by cartoonist Sarah Leavitt. The Belkin gallery at UBC had a exhibition called The Beautiful Brain, featuring drawings by Spanish neuroscience pioneer Santiago Ramon y Cajal, who won the Nobel Prize in 1906. This collection of eighty ink drawings show remarkable detail, and reflect his developing understanding of neurons, back when it was not clear that neurons were even a thing. His visual explorations are him thinking about what he has seen through a microscope with innovative stain techniques. I could not really absorb it all, but I was intrigued by this demonstration of drawing as thinking and science in action. This was the last year r can get into the PNE for free. This year, she and her friend wandered around on their own and met back at the appointed place, and almost the appointed time. L and I were able to see things on our own, like the Toy exhibit, giant bugs, and the bees and livestock, which we might have done otherwise, but at least we could take our time and without the whining. I was able to eat chicken waffle and chicken feet. But maybe child supervision would have saved us from buying the expensive Titanium cookware. I was afraid my neighbor's house would block it, but I just had enough room. On stage at the Firehall theatre, I was intrigued by this half hour panel ranging in experience and perspective, moderated by Sally Ito, a scholar, poet and translator with whom I'd done a reading. I'd seen Matt Miwa interview his elders about their experiences at Hastings Park and Tashme. Afterward, I saw Yoshie Bancroft perform in The Japanese Problem, a theatrical interpretation she created about being incarcerated in Hastings Park. Jay Rubin translated Haruki Murakami, but here he spoke of his novel about Japanese Americans during the War. I'd read Joy Kogawa's Obasan and her most recent Gently to Nagasaki.